We’ve read about evil men–evil men are here and evil men are coming. Just search the internet, look at Amnesty International and other organizations. Kim Jong-il of North Korea leads the most isolated and repressive regime in the world. When he is angered at a single citizen, he will actually punish three generations of their family for the crime. He has detained over 200,000 of his own citizens in labor camps, and tortures and jails anyone trying to escape his country. King Abdullah of Saudi Arabia will torture anyone who is considered a threat to their society, and oppresses women to the point that all women have to seek permission from a male just to see a doctor. Hu Jintao of China forces abortion, controls all media, and harshly limits the practice of all religion. Ninety-nine percent of all trials result in a guilty verdict–in other words, there is no justice, especially when you consider that right now there are a half-million Chinese currently in punitive detention, meaning in jail or prison without a charge or trial, and thousands more under house arrest, harassed and under surveillance. Evil men are here, and evil men are coming. Turn in your Bibles to Daniel 8, and follow in your outline as the prophet tells us about the most evil of all men. We are studying the book of Daniel, and find that our friend Daniel is upset by what God reveals to him in chapter 8. What causes Daniel to be shaken? He sees two great powers in conflict, then an evil man rising up from the second great power who persecutes God’s people. But as the prophecy continues, an angel explains that this evil man seems to foreshadow another man, who is coming in the future, who is even more evil and deadly than the first. Now chapter 8 begins a major division in Daniel’s letter. What you can’t see is in the original text he moves from Aramaic back to Hebrew, showing a change of focus. Chapters 2 to 7 were written in Aramaic, the language of the Gentile world, to be a witness to the unbelieving world of the absolute sovereign control of the one true God, and to encourage the Jews of God’s care for them. But chapters 1 and 8 to 12 were written in Hebrew to describe the destiny of the people of Israel. God’s people are told they have a future–it is a future that involves persecution and hardship, but they also are given the hope of a resurrection, rescue, and rest before this letter ends. Chapter 8 is the second of Daniel’s four visions in this letter. His first vision was Daniel 7, where Daniel saw four world empires to which his people Israel would be subject for long centuries–Babylon, Medo-Persian, Greece and Rome. Now in Chapter 8, Daniel is given more details concerning the second and third empires, Persia and Greece. Part of the reason is to prepare them for a coming evil man, a ruler who would arise and unleash terrible hatred against the Jews and Jerusalem, foreshadowing another cruel leader, the antichrist, coming in the eschatological future–our future. So look with me at . . . Though people say they’ve had a vision, we know this one came from God, is recorded in Scripture, and was literally painful for Daniel to see. Just before the fall of the Babylonian empire in Daniel 5, as Daniel is in Babylon, in this second vision, he’s transported 230 miles away to Susa. At that time an insignificant area, but in the future would be an important capital of the coming Persian Empire (the next empire), and would be the future home of Esther and Nehemiah. In this vision, God is going to reveal some dramatic truth about the next two empires after Babylon. So the vision takes Daniel to the capital of the next empire, which is . . . Ancient historians tell us that as Persian generals and monarchs stood in front of their troops ready for battle, they would wear the head of a ram, and the horns of the ram as a part of their attire. Daniel sees a normal two-horned ram, but as he watches, one horn grew bigger than the other. Later in verse 20, Daniel is told the ram is Medo-Persia, and even though the Medes were the strongest at first, very quickly the Persian horn under Cyrus the Great grew larger, and became the stronger of the two peoples. Then Daniel says the ram moves in three different directions, west, north and south, and was impossible to stop, establishing the largest empire the world had ever seen to that day. But the Medo-Persian ram was destined to be destroyed by . . .
Verses 5, “While I was observing, behold, a male goat was coming from the west over the surface of the whole earth without touching the ground; and the goat had a conspicuous horn between his eyes.” Just as Daniel is watching the ram, a male goat, a buck, a he-goat with a conspicuous horn between its eyes appears on the scene to challenge the ram. This goat is so fast his feet do not touch the ground, and he attacks the ram with such power and wrath, the ram is totally defeated. And just at the height of the goat’s strength and influence, the obvious horn is broken, and in its place four prominent horns appear and extend in four directions. Thankfully God reveals to Daniel in verse 21 and 22 exactly what this symbolism is describing. “And the shaggy goat represents the kingdom of Greece, and the large horn that is between his eyes is the first king. 22 And the broken horn and the four horns that arose in its place represent four kingdoms which will arise from his nation, although not with his power.” The goat is Greece, the great horn is the first king, Alexander the Great, and the four horns which replace the first horn are the four kingdoms which follow, each led by one of Alexander’s generals after his death. Kids, did you ever ask your parents to buy you some green army men, a GI Joe, or guns to play with? I loved those green army men, cap guns, then rubber band guns, real guns—hmmm, is there a pattern there? I thought I’d grow up to be a soldier or a navy skipper. Alexander, as a child, was trained to be a great military commander. But get this–he didn’t play with toy soldiers, he played with real soldiers. As a child, his father Philip gave his son Alexander a real army to practice with. Can you imagine that? Picture some of our five to ten-year-olds here playing with a real army just for fun–go attack! At the death of his father, and with a love for all things Greek, and a hate for all things Persian because of what the Persians did to Greece 150 years before, Alexander at 22 years of age, with a small mobile army of 35 to 40 thousand, begins his campaign to free all Greeks from the threat of Persia once and for all. And he didn’t stop until he’d conquered the world. Now 150 years before Alexander, Greece was invaded by a million Persian soldiers, led by the Persian ruler Xerxes, who desired to annihilate the Greeks (and Xerxes’ father before him invaded Greece). Three hundred Spartans, with some sixteen hundred other Greeks, held a million Persian soldiers at bay at Thermopylae under Spartan King Leonidas. The Persians commanded the Spartan King Leonidas to surrender, and to lay down his weapons. Leonidas shouted back a phrase in Greek which means, “Come and get them”–the phrase under his statue found in Sparta today. Before Xerxes left Persia, he banished his queen Vashti when she didn’t perform for him. But after he returned from his Greek defeat, he was humble enough to actually listen to his new queen, named Esther, when she entered his presence without being summoned. God is provident. But just at the beginning of democracy, just as men began to live free, many thousands of free Greeks died at the hands of these invading Persians, and the Greeks never forgot—and 150 years later, they still hated the Persians. So Alexander was committed to destroying the entire Persian world empire. In verse 6, the words “mighty wrath” have to do with powerful venom, hostility, fury, rage–literally the heat you feel when you are all worked up. These Greeks are white hot–what happened? With only 35- to 40,000 troops, they defeated Persian armies almost ten times that number. Historians say Alexander and his troops fought at an unnatural level, they were enraged by the wrongs done to them by the Persians. Just a helpful tip for the FBC family–never make Jack Skandalakis angry. In verse 7, the word enraged paints a picture of suffering anguish, experiencing bitterness, then finally rebelling against that bitter suffering. The Greeks had had it with the Persian threat, and in Asia Minor, the Greeks were still enslaved under Persian masters. So with the beginnings of western culture, democracy and freedoms–which pitted them against this eastern Persian people–Alexander and his Greek army devastated the Persians. In verse 7, the words hurled them down means to scatter with great violence. And trample is to crush, kill and destroy in every way. I don’t like spiders, and if I step on one, I don’t tap it–I crush it until there is nothing left but a stain. This is what the Greeks did. So on his mission to destroy the Persians, Alexander also conquers the world. Once the Persians were defeated, he continued his campaign–but soon his troops grew weary, since the main goal was to defeat the empire of the Persians, which they did to the utmost. So Alexander’s army returned to the great city of Babylon. Then verse 8 says, “Then the male goat magnified himself exceedingly. But as soon as he was mighty [literally vast, numerous, accomplished], the large horn was broken; and in its place there came up four conspicuous horns toward the four winds of heaven.” Alexander dies at 33. (History tells us he died from a fever or a drunken stupor, choking in his own vomit.) There’s no heir to the throne, which results in 22 years of conflict and subterfuge, ultimately leading to four of Alexander’s generals dividing up all the conquered territories and ruling the four points of the compass. Cassander took the west, Lysimachus took the north, Seleucus took the east and Ptolemy took the south. Read verse 22, “And the broken horn and the four horns that arose in its place represent four kingdoms which will arise from his nation, although not with his power.” The four generals and the four kingdoms were not as strong as when it was united under Alexander. And very quickly the west and north, mainly in Europe, began to crumble and make a way for Rome to grow into the next major empire. But the Ptolemy empire in the region of Egypt, and the Seleucid empire in the region of Israel, and Syria continued on for centuries. And it was out of the Seleucid empire that an evil leader would rise and foreshadow an even greater evil leader coming in the future. As Daniel’s second vision continues, he sees a little horn–a ruler coming from one of the four horns, from one of Alexander’s generals. Verse 9, “And out of one of them came forth a rather small horn which grew exceedingly great toward the south, toward the east, and toward the Beautiful Land [the land of Israel].” Between verse 8 and 9 there is a 126 year gap. Who is the small horn? Most scholars agree he is Antiochus IV Epiphanes–eighth in the line of successors from Seleucus, reigning in Syria, from 175-164 BC. Now don’t get confused–Antiochus is not the little horn of chapter 7, since that horn came from the reborn fourth Kingdom, whereas this little horn comes from the third kingdom of Greece, letting us know that throughout history there will be evil leaders. A horn is symbolic of rule and power. And both chapter 7 and 8 evil leaders are alike in their hatred of the Jews, their hatred of God, and their irreverence for the temple of God. In fact, Antiochus Epiphanes, the enemy of the Jews during the closing of the Old Testament and the opening of the New Testament (called the inter-testament period), foreshadows the antichrist, the enemy of the Jews during the coming seven-year tribulation. What was Antiochus Epiphanes’ [I will call him AE] problem? Why did AE hate the Jews so much? Like every evil megalomaniac dictator, AE wanted more–more honey on his morning toast, along with more countries under his control. He tried to take Egypt, but was defeated by the growing Roman threat. So in order to strengthen his defenses against Rome, he sought to unify his empire by imposing Greek language, culture and religion on all his subjects, which included Israel and all the Jews. A unified empire would better resist an external threat like Rome. From 1 & 2 Maccabees and the writings of the Jewish historian Josephus, we learn the precise manner in which these prophecies were fulfilled. AE systematically looted the temple of its treasures, even carrying off the golden altar, table and lampstand. Verse 11 tells us, he then caused the daily sacrifice to cease by erecting an idol, probably of the supreme Greek god Zeus–and get this, sacrificed a pig to it. (You all know how the Jews felt about pork—it is an abomination.) As verse 12 says, the true worship of the one true God, the God of Israel was literally cast to the ground, the truth of the Scriptures was rejected, and the false religion of paganism was substituted in its place. Why is this happening? Verse 12 says on account of transgression. The Jews had become materialistic, complacent and compromising, and it took persecution to wake them up to their faith. I wonder about the Church today. Many rabbis have said in the 1930’s the Jews were so secularized they didn’t even look like Jews, and it took Hitler to put a star on them to actually remind them who they were, and cause them to want to return to the land of Israel. What is happening here is so horrible, heaven is appalled. This went on for six years and four months, and we know exactly when it ended–December 25, 165 BC, when the Jewish revolt under Judas Maccabeus cleansed and restored the temple. A tough group of Jews led an amazing rebellion and got rid of AE. It was such a significant event, the Jews still celebrate it to this day with the Jewish feast called Hanukkah. Meaning dedication, it celebrates the rededication of the temple once they got rid of Antiochus Epiphanes and their Syrian overseers. It is also called the Festival of Lights. As the Jews recaptured their temple, there was only enough special temple olive oil to burn in the menorah for one day. But the oil miraculously lasted for eight days, and the Jews commemorate that event as they repossessed their temple, by placing candles in a menorah for eight days around December 25th. A persecutor of the Jews in Russia asked a Jew what he thought would happen if the persecution continued. The Jew said the result would be a feast. Pharaoh tried to destroy the Jews, but the result was the Passover. Haman attempted to destroy the Jews, but the result was the Feast of Purim. Antiochus Epiphanes tried to destroy the Jews, but the result was the Feast of Dedication, or Hanukkah. As a result of the Maccabean revolt, the Jews were finally free from the Seleucid Greeks for a hundred years. Then after that century of freedom, through political force, Rome took over and occupied Israel in preparation for the coming of the Lord Jesus Christ. So what does all this mean to us? Can you identify with Daniel? In verses 15 to 18 Daniel is having a hard time understanding his own vision. We have the advantage of comparing most of these prophecies with historical fulfillment, and yet we still find them difficult. But God had mercy on us and Daniel, and sent his angel Gabriel to give some understanding, even though Daniel faints. Gabriel is the only angel ever named, except for Michael the chief angel. He appears thirteen years later, and gives Daniel the prophecy of the end in Daniel 9. Five hundred years later, Gabriel appears to Zacharias the priest to announce the birth of his son, John the Baptist. Six months later, he announces to Mary the incarnation of the Son of God. And Gabriel is probably the one who also told Joseph about Jesus being born. It’s important to realize that the book of Daniel uses the word end to describe the time approaching the second coming of Christ, as seen in chapter 12. So I believe these verses describe Antiochus and the antichrist. There are prophecies in the Bible that have a double fulfillment, describing a coming event or person, but foreshadowing even another greater event or person. Like when Isaiah condemns the king of Babylon in Isaiah 14, but he is also describing the person and pride of Satan in his fall. This is called double fulfillment, or typico-prophetic. 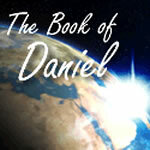 Here in Daniel 8, you have a prophecy given in 551 BC. The prophecy is fulfilled in 165 BC with Antiochus, but also looks ahead to the coming evil antichrist in our future. So we are looking at a coming time of distress for the Jews, but we are also looking at the end of time when another evil man with satanic hate will seek to destroy all of God’s people, Jew and Christian. His name is antichrist, and he is someone you don’t want to meet. As Gabriel begins, he identifies the ram as Medo-Persia, and the he-goat as Greece in verses 20 and 21–then the great horn and the four kingdoms that arise from Alexander’s conquest in verse 22. But the main burden of Gabriel’s message concerns the little horn. Look carefully at these verses as I highlight what they tell us about this sinister person, keeping in mind that often both Antiochus and the antichrist are in view. Verse 23a, “And in the latter period of their rule, when the transgressors have run their course,”–when does this occur? In the latter period–this most likely refers to the latter time of the four kingdoms. So toward the end of the Seleucid Empire influence over Israel, which is when Antiochus ruled. But because Gabriel uses the phrase “when the transgressors have run their course,” it’s pretty obvious sin didn’t end with Antiochus’s overthrow.” And since there are two ends in focus here, it is probably when sin is at its height with humankind. The antichrist will come for a short time before Jesus returns and rules the world in righteousness. Verse 23b, “A king will arise insolent and skilled in intrigue.” Antiochus and the antichrist will be insolent, which means a willingness to be harsh and violent. He will be very intimidating. The phrase “skilled in intrigue” can mean two things. It could mean that he solves riddles and is a great problem solver–I think that will be true. The antichrist will solve the problems of the world, or at least they’ll think he does. He will be an incredible intellect, and will be able to play political games, and win every time. But this phrase “skilled in intrigue” could also mean he consults with mediums and demons. In other words, he is occultic. Many of the world’s despots, those who have butchered thousands of people, have been known to be demonically-motivated, but they will be nothing like this final evil leader. So a demonic genius will rise up among world leaders at the end of the age, and will deceive others with his great mind and . . .
Verse 24a, “And his power will be mighty, but not by his own power.” He will be mighty, but not by his own power, because he is energized by Satan. In Revelation 13:2b, it says that the dragon (Satan) gave him (the beast, who is antichrist) his power and his throne and great authority. The antichrist is a Satan-indwelt individual, and he will be far worse than an Antiochus, and far more powerful than an Alexander. Verse 24b, “And he will destroy to an extraordinary degree and prosper and perform his will; he will destroy mighty men and the holy people.” When it says he will destroy to an extraordinary degree, that means the world will be in awe at the devastation the antichrist brings–the secular world will be shocked by the horror this man causes. Antiochus had just over six years, and the antichrist will have seven years. But during that time, verse 24 says the antichrist will level the kings, rulers, and leaders of the world, as well as the people of God in a holocaust of destruction that’s beyond description. The world will want, not reject, the antichrist. He will be appealing, not repulsive. He’ll be extraordinary, not ordinary–yet in the end, he will murder millions. And the world will hang its collective mouth open at what this evil man does. Verse 25a, “And through his shrewdness he will cause deceit to succeed by his influence; and he will magnify himself in his heart, and he will destroy many while they are at ease. He will even oppose the Prince of princes.” The antichrist will be a satanically indwelt genius who will gain control by propaganda and deception, which makes this era in history ripe for him to take the stage. Every time the Scripture describes the antichrist, we are always told he is self-exalting, wanting what Satan desires more than anything, which is to have the world worship him. Revelation 13:4b, “and they worshiped the beast,” 2 Thessalonians 2:3 and 4, “the man of lawlessness . . . 4 who opposes and exalts himself above every so-called god or object of worship, so that he takes his seat in the temple of God, displaying himself as being God.” The antichrist wants what only God deserves–genuine worship. But at the end of verse 25, when the antichrist finally goes up against the Prince of princes, the Lord Jesus Christ, he will have met his match. Verse 25b, “But he will be broken without human agency.” No human can stop him, but God can, and He will be stopped when Jesus Christ returns and sets up his glorious thousand-year earthly Kingdom. Revelation 19:20 says, “And the beast was seized, and with him the false prophet who performed the signs in his presence, by which he deceived those who had received the mark of the beast and those who worshiped his image; these two were thrown alive into the lake of fire which burns with brimstone.” This is the fate of the antichrist and everyone else who does not follow Christ. So how does the vision end? What does this vision do to Daniel? Verse 26, “And the vision of the evenings and mornings which has been told is true; but keep the vision secret, for it pertains to many days in the future.” What does Gabriel mean keep it a secret–does he mean not to tell anyone? No, that can’t be because it is written here. A better translation of the Hebrew phrase is to hold on to it, or preserve the vision–for it’s going to be many days before it comes to pass. There is a time gap between Alexander and Antiochus, and an even bigger time gap between Antiochus and the antichrist. So Gabriel is saying, because there are millions of God’s people who need to understand this vision, make sure you preserve it. And just like Daniel was to make certain it was preserved and heard, so we need to make sure it is heard. Friends, do we need to warn the world where they are headed without Christ? Yes, we do. Verse 27, “Then I, Daniel, was exhausted and sick for days. Then I got up again and carried on the king’s business; but I was astounded at the vision, and there was none to explain it.” Daniel may have fainted again here, but certainly after learning about his people being slaughtered, Daniel was sick. Like Daniel, not only do you have the responsibility to share the only message of hope with a dying hell-bound world, but you also have a responsibility to love people like Daniel loved people. And not just your family, but people who are lost, easily deceived, doing evil things–just like you before Christ had mercy upon you. Never forget . . .
1 Providence God is at work in the nations, bringing them to His desired conclusion–just like Medo-Persia to Greece and beyond. Like God worked through Xerxes’ defeat, and Antiochus’ evil, God is working through evil people in your life. As Joseph said to His brothers, in Genesis 50:20, “You meant evil against me, but God meant it for good.” And only a genuine Christian can say Romans 8:28, “God is working all things together for good” in your life. Don’t look for secret purposes, but know that God is at work in everything for His glory and your good. 2 Pray for the persecuted Church There are more Christians dying today around the world than any other time. Persecution has increased and we need to pray. 3 Purpose to live for Christ and not yourself Stop wasting time. Christ is coming soon. Don’t be embarrassed, stop making excuses–our time, our money, our service, our passion need to be Christ’s. Some of you love UCLA, USC, Boston, the Chargers—fine, but if the people around you cannot tell that you are a rabid fan of Jesus Christ, His Church and His Gospel, then you need to repent. And finally . . .
Only the Gospel of Jesus Christ is the answer–plead with others to turn from their sin and depend only on Christ. Show your children that you understand your mission on planet earth. Demonstrate to all that you know Jesus Christ is coming soon. Evil men are here, and evil men are coming, but Christ will prevail.